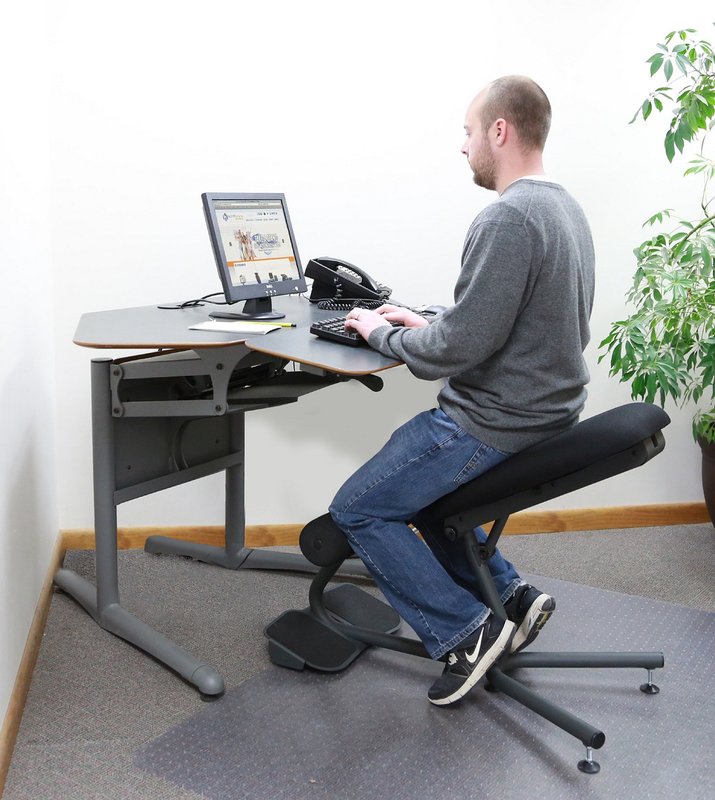 The Stance Move chair allows the user to achieve several healthy and energetic working positions. Forward sloped sitting, kneeling and assisted standing are all healthy postures that provide the worker with unparalleled well-being and energy in the workplace. This is the only ergonomic, sit to stand, 3 position chair on the market! While standing is the preferred method of working in the office environment because of the health and energy benefits it provides, standing for 8 or more hours out of the day is not recommended either. The human body is meant to stay in motion and the Stance Angle Move helps provide that motion throughout your workday. When you must sit, sit healthy! 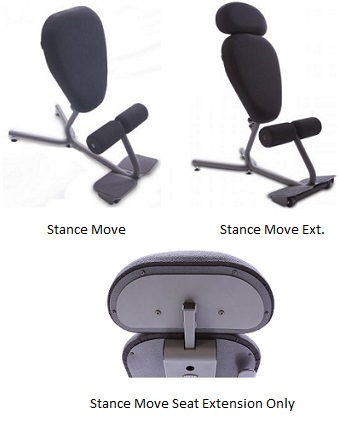 The new improved Stance Move provides the user with a backless seating design that helps build balance and core muscles while providing hours of comfortable use. 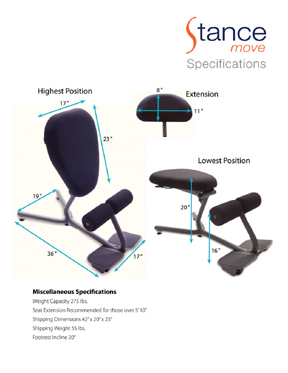 The seat can also slope forward to decreases the load on your lower back and minimizes the risk for back pain. Sitting with your thighs in a downward slope increases the activity of your lower leg muscles. As a result return blood flow from the lower legs is improved, and there is less pooling of the blood and pain in the lower legs by the end of the workday. Consequently, in the long run, it can reduce the likelihood of contracting varicose veins. A sloping seat pan not only makes rising from the chair easier, but also allows your leg muscles to recover sooner because any postural changes and shifts are also easier. Another innovation of the Stance Move is it’s ability to transform into a kneeling chair with one touch of a lever. 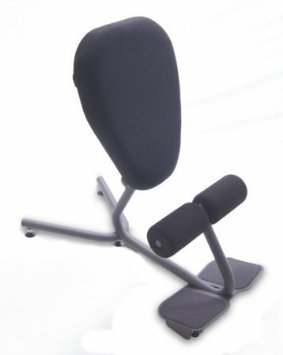 The kneeling function of this chair promotes good posture and helps strengthen the lower back muscles helping proper spinal alignment while keeping your back positioned correctly. Kneeling is a very comfortable and healthy workplace posture that is recommended by many Doctors and Chiropractors. Last but not least, Assisted Standing is the posture that really sets the Stance Move apart from all other chairs. Standing unassisted for prolonged periods of time can cause fatigue and muscle soreness. Assisted Standing in the Stance Move will allow the user to stand comfortably for hours at a time in the workplace providing good posture, energy, and well-being.